How can something so amazing, with such intricate detail intentionally be designed to entrap and destroy? 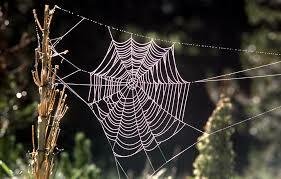 The web is sticky and the openings small so as to immobilize insects. I saw a web intertwined among the tree branches outside my office window. The web was empty, moving ever so slightly with the blowing wind. It looked harmless. What I could not see was the master weaver, the spider who spun the web. The spider’s intent is to devour its prey. It may have been out of sight at the time but at just the right moment, the spider would pounce on the entangled insect caught in the web. You would think by now, insects would beware of webs. The thorns of the world are in some ways like the spider web. We can become consumed by this world’s riches, our daily responsibilities to family and work obligations. These things are not bad in and of themselves but the one who spins the web can use them to choke the word God has instilled in us. Just like the spider, Satan will use the concerns of life to stifle our spiritual growth, strangle our ministry and suffocate the desire to do God’s will. Satan sets the trap then disappears into the background. We must be aware and “Be sober, be vigilant; because your adversary the devil walks about like a roaring lion, seeking whom he may devour. (I Peter 5:8). Spiders are still spinning webs because it works and Satan is still setting traps. Pray for discernment that you may be able to recognize Satan’s deceitful web and avoid the trap.